Financial Transactions may be made up until 3:30 p.m.
Students must have their I.D. card with them at all times during school hours and to conduct business in the Business & Activities Office. Our system is computerized and we must scan the student's I.D. Card. The Business & Activities Office will no longer take PERSONAL CHECKS from ANYONE. We do accept cash, money orders, and credit cards. Thank you for your cooperation. ASB Card - $50 - Gives student FREE access to Football, Basketball, Wrestling & Volleyball games, discounts to dances, yearbook, and other activities. It also pays for buses, referees, tournaments and awards at the end of the season. It pays for itself if you buy it early in the school year. Don't miss out!! Buy yours today!! CARDINAL CLASS COLLECTION - Returning By Popular Demand! Click BELOW to view the items & the Special Price for the most wanted Cardinal items. The Cardinal Class Collection is ONLY available during Program Confirmation through the end of August. Price is $220. PE clothes are available for purchase in the B&A Office. Ask your teacher for more information if you are in need of "loaners". Scroll down to view photos of items available. Misc. items available at all HOME football games!!! 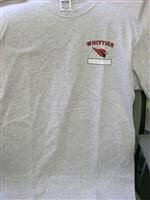 Dusty Red "Cardinals" T-shirts - Crew Neck $10, $12 for 2X. V Neck $12, $14 for 2X. Stop by the Business & Activities Office to do your shopping. YEAH!!! We DO accept credit cards at this time. Call the office for more info. You can make arrangements to pick up these items at Whittier High School, 12417 Philadelphia St., Whittier CA 90601. If you would like the item mailed to you please call for the postage amount due. Mail any payments for items attn: Janice Zolnekoff at the school address. Thanks for shopping at WHS!! Call 562-698-8121 x2010 for more info. PE Clothes: Grey T-Shirt $12 each, Red Shorts with drawstring $13 each. You may wear any White, Red or Grey plain shirt or any Red, Grey or Black plain basketball shorts. Heart Shaped Key Tag $1.00 "and always always love you Whittier High"